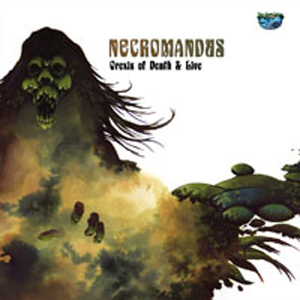 Necromandus - "Orexis of Death & Live"
Necromandus was a band that Tony Iommi managed for a year or so that was suppose to release a record in April 1973 on Vertigo that never happened. This was released in 2001 on 500 copies without the live record from 1973. Anyway, this is a very cool double vinyl gatefold LP with a nice booklet and some copies come with a demo 7" of one track. The band plays melodic progressive rock and sometimes a bit harder edge. They have an excellent guitar player. This is a record that really grows on you after some time and would have been a classic if it had been released in 1973! A bit too late now as 3 of the 4 original members are sadly dead now. This deluxe double vinyl gatefold is beautiful and comes with a fantastic detailed LP size multipage booklet. Very impressive record. The live LP is not nearly as good as the real unreleased record. I hope that Rise Above finds more of these gems.